The Princeton Offense was created by Hall of Fame coach, Pete Carril, during his incredible 29-year, 514-win tenure as coach of the Princeton Tigers. The legacy this offense has left on basketball can be seen today at every level. 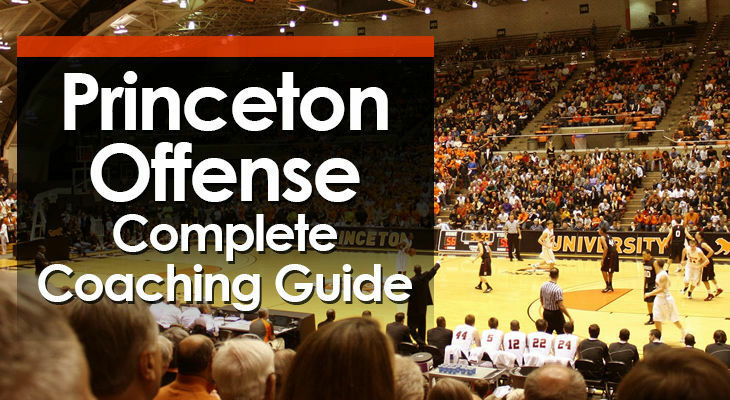 Many coaches have adopted the Princeton offense because it teaches players how to read the game and make decisions (important) and doesn't rely on constant play-calling from the sidelines. It also gained popularity for being a 'positionless' offense. Meaning that all five players on the court can fill all five positions and be effective. Who Should Run the Princeton Offense? The most important thing you need for this offense to be successful is a post player who has a high basketball IQ, passes exceptionally well, and can knock down a shot consistently from distance. If you don't have a post player who fits this description (they're rare), then the Princeton offense may not be your best option. You see, this offense is primary run through a big man who patrols around the high post. The team relies on this player to read the defense and make smart decisions. Surrounding this versatile post player must be four players who can shoot from distance, read the defense, and make smart cuts and passes. Unselfish Play - Players must be willing to sacrifice a good shot for a great shot. This offense won't be effective if you have one player who wants to hold the ball and try to create on their own. Ball Movement - The basketball must be constantly moving through hands. From side-to-side and inside-out. The offense will suffer if the ball gets held up in one area of the court. Constant Motion - There is no standing around in the Princeton Offense. Players must be on their toes ready to make a hard cut to a different position on the floor. Capable Outside Shooters - Since this offense relies so much on backdoor cuts and passing the basketball inside, it's important that the defense can't sag into the key. You need shooters who force their opponents to stay close. Teaches Players How to Play - There aren't any play calls when running the Princeton Offense. Instead, players must learn how to read the defense and then make high-IQ basketball decisions. This experience will help all players with their future basketball in any offense. Positionless Offense - As written at the start of the guide, players are required to play multiple positions and effectively execute multiple skills. Difficult to Defend and Scout - When running an offense which allows players to make decisions, the defense can't predict in advance what the offense is going to do. This makes it a very difficult offense to prepare for. Lots of Scoring Options - Depending on how much of the offense you teach to your players, there are many scoring options available for every position. Players Must be Patient - For players who have been raised in an offense where shooting quickly is praised, transitioning to the Princeton offense which requires constant ball movement and patience can be difficult. Requires Well-Rounded Players - When running the Princeton Offense, all players should be able to pass, cut, dribble, screen, and score from both inside and outside to make the most of this offense. Big Learning Curve - If you're teaching the complete offense, there are a many different options that your players must learn. And since it's a positionless offense, players must learn the actions of all positions. Poor Spacing Can Ruin This Offense - If you have players who don't understand the importance of spacing, it will be very difficult for this offense to be effective. Timing on cuts and screens is crucial. The Princeton Offense starts in a 2-2-1 formation. Two players at the top of the key in the slot positions (1 and 4). One player on each wing (2 and 3). And a player in the low post on ball-side (5). Keep in mind that the four perimeter positions are all positionless and even the player on the low post doesn't need to be a dominant low post player. Throughout this offense the post player will be used as a passer in many actions. Even if they're shorter than most traditional bigs, putting a high-IQ player in this position can do wonders for your offense. While there are hundreds of different options that you can use when running the Princeton offense, not all of them are simple and effective. Below, I've put together a blueprint that is guaranteed to get your players attacking the rim and give your team open looks from the outside. (1) passes to (3) on the wing and then cuts through to the weak-side corner. If the pass can be made into the low post and they have an advantage inside, the first option is for (5) to post up one-on-one and look to score. After feeding the post, (3) screens for (4) at the ball-side elbow area. It's important that neither player rushes this screen. Both players should slow down and read the positioning of the defenders before cutting. If the defender plays tight and attempts to fight over the screen, (4) can go backdoor and look for a quick pass from (5) and an open layup at the front of the rim. If the defender is loose and gets caught on the screen, (4) should use the screen a cut out to the wing for an open midrange or three-point shot. Whichever cut (4) decides to make, (3) will always do the opposite. If the pass can't be made into the low post, (3) will take two dribbles along the three-point line towards the (4). If the defender plays tight and attempt to cut off the dribble hand off, (4) can back-cut to the rim. Receiving a one-handed bounce pass from (3) for the layup. If the defender plays loose, (4) can receive the dribble hand off from (3). At the same time, (5) is cutting to the top of the key to screen. If (4) receive the dribble hand off, (5) screens for them to attack the hoop. If neither of these options are open, (3) keeps the basketball and swings the pass to (2). When this happens, (5) will then set a back-screen for (3) who will make a shuffle cut towards the open key where they can receive the pass for a layup. The point series (also known as the high post series) is initiated with a slot-to-slot pass. When this happens, (5) steps up and sets a back-screen for (1) who then cuts towards the basket looking to receive the pass for an open layup. If they don't receive the pass, they clear out to the ball-side corner. After this, (5) receives the pass on the high post. From this point, (4) has three different cutting options. And the option they select will dictate the rest of the offense for their team. When running 'away', (4) cuts away from the basketball and sets a screen for (2). (2) reads their defender and has the option to either cut to the ring looking for a pass and layup, or pop out to the top of the key looking for an open jump shot. The first option is for (2) to receive the pass from (5) and finish with a layup. If that's not open, (5) will pass out to (4) who has cut to the perimeter and then set an on-ball screen. On the other side of the floor, (3) will set a down-screen (2) who can pop out for a midrange or three-point shot. This gives the dribbler a great chance to attack the hoop with a shooter on the wing and a player in the short corner. If (2) decides to use the screen, they will receive a dribble hand off from (5). Off this DHO, they should be able to quickly turn the corner and attack the rim. This action can leave the key wide open with a shooter in each corner. Instead of cutting, (4) stays out and plays a safety role. The reason for this is because they don't have enough time to cut through without taking up the free space inside the key. For 'over', (4) cuts above the post player with the basketball and sets a screen for (3) on the wing. Once again reading their defender, (3) can choose to cut backdoor if it's available or use the screen and receive a dribble hand off from (5). If (3) chooses to cut towards the rim, (5) can make the pass if it's open. If not, (3) must retreat back out to the corner on the same side of the floor. This triggers (4) to receive the dribble hand off from (5) just above the high post. They should be looking to quickly turn and attack the rim. While this is happening, (2) sets a down-screen for (1) on the weak-side of the floor. This keeps their defenders busy and can potentially open up a player for a shot. If (3) chooses to use the screen instead, they will cut to the top of the key and receive a dribble hand off from (5). (4) will roll to the short corner or three-point line depending on their ability to shoot. (3) receives the DHO and looks to immediately attack the rim. Exactly the same as in the previous (2) sets a down-screen for (1) hoping to get one of them open on the perimeter while keeping their defender's busy. When running 'under', (4) cuts below the post player with the basketball and then receives a screen from (2) on the low block. (2) continues to curl around after the screen and performs a DHO with (5) on the wing. From here, (4) should look to attack the rim immediately. 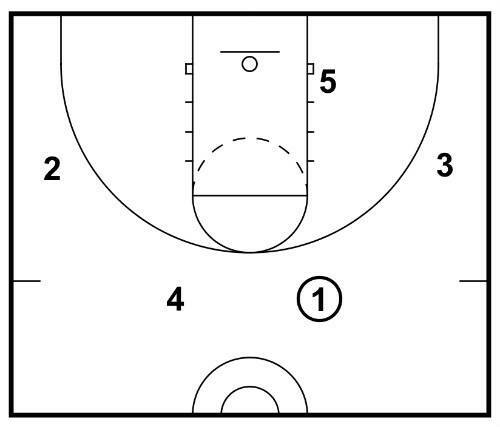 On the other side of the floor, (2) will set a down-screen for (1) to pop out to the wing. This gives (4) several passing options along with the ability to attack the rim. Fun Fact: Wondering why this is called the 'chin' series? When this was first run at Princeton, the player dribbling the ball down the court would rub their chin several times to signal this part of the offense. The chin series begins with a dribble handoff and an exchange on both wings. When this happens, the post player (who should be on ball-side), slides up to the high post. The ball is then swung around the perimeter as (3) passes the ball to (2) and then to (4). After (3) makes the pass, (5) sets a back-screen on their defender and (3) makes a shuffle cut towards the rim looking to receive the pass from (4). This will often be open for a wide open layup. If it's not, (3) clears out to the ball-side corner. The next action is (5) setting a flare screen for (2). If they receive the pass and they're wide open, take the shot. But if they receive the pass and they're not able to shoot, (5) will re-screen with an on-ball which will allow (2) to attack the hoop with shooters in both corners. The second option is for (2) to curl off the flare screen and cut to the hoop. If they're open, (4) will make this pass for the layup. If they're not open, (2) must cut to the weak-side corner. After this happens, (5) will sprint over and set and on-ball screen for (4). This will give them a fantastic driving opportunity with two shooters on the weak-side of the floor to pass to if they can't get an easy layup. For the Princeton offense to be effective, you need complete buy-in from every player on your team. If any players choose to deviate from the offense during games, it will mess up the team's spacing and the offense will quickly come to a stop. Every single player must be willing to put the team before themselves for the Princeton offense to be successful.